For the next two weeks, I’ll be posting highlights from my first virtual online trunk show, an online showcase of new gemstone beads. The show runs from April 9 to April 23. I hope you’ll check it out! Want to know what’s in the trunk show? Let’s start with genuine Burmease jade. This is jadeite, the real thing! Jadeite is one of the two types of genuine jade, the other being nephrite. Jadeite is the more rare of the two. Multicolored jade has shades of bright orange, golden yellow, black, creamy white, and jade green. 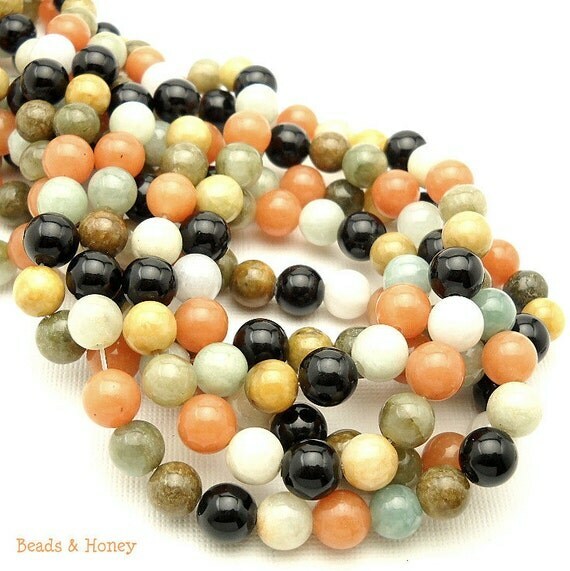 Extremely high quality beads that are both beautiful and long wearing. Remember, today is the last day to save 15% today with code TRUNKSHOW15. But, you’ll still be entered to win a strand of genuine Arizona turquoise if you make any purchase between today and April 23! To keep up with trunk show updates, be sure to stay connected via the blog, newsletter, Facebook, Twitter, or Google+. I hope you enjoy the show as much as I have enjoyed putting it together! Let me know. What’s your favorite part of the show?